Unlike traditional eLearning courses, which typically organize content in a linear way, content in OttoLearn is organized in a hierarchy consisting of Mastery Profiles, Modules, Topics, Concepts, and Activities. Arranging information in a hierarchy is a natural way to organize content. 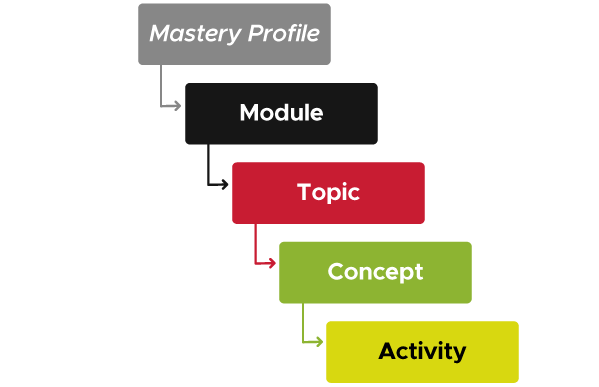 Think of a Mastery Profile as a library, a Module as a book, a Topic as a chapter, and a Concept as a page. This organization makes it easy to see related information, which is important as you add and remove content over time. Each Module can be assigned to one or more Mastery Profiles. This allows you to deliver reusable content to learners with different job profiles. For example, learners with the Retail Employee Mastery Profile, as well as learners with the Warehouse Manager Mastery Profile, must complete the First Aid Module. Like books, Modules group all of your content. While Modules (books) can be assigned to different Mastery Profiles (libraries), your Topics (chapters) and Concepts (pages) are tied to the Modules they are created in and can’t be shared. For example, if you add the Hand Washing Topic to the First Aid Module, you can’t also add it to the Kitchen Procedures Module. We recommend using the knowledge map when creating your content so you can easily see how everything fits together. When creating your content in OttoLearn, it is important to consider how it will be organized in the knowledge map. When planning out your map, think about how your content will be split up and what you want to name each component (most components simply consist of a name). Concepts are the heart of mastery and each one should cover a snippet of information, like a page in a book or slide in a PowerPoint presentation. You don’t need to have your Activities written out, but you should have an idea of how many Activities you will need. We recommend creating 3-6 Activities per Concept. If you think you will need more Activities, you may want to further split up your content. If you’re using OttoLearn for the first time, we recommend planning out your map in advance (for instance, using an application like https://bubbl.us/). Later, as you become more comfortable organizing your content, you can skip this planning phase and build your map right in the OttoLearn system. You can learn more about how to organize your training and write effective Activities your learners will love by reading our Creating Effective Content whitepaper. 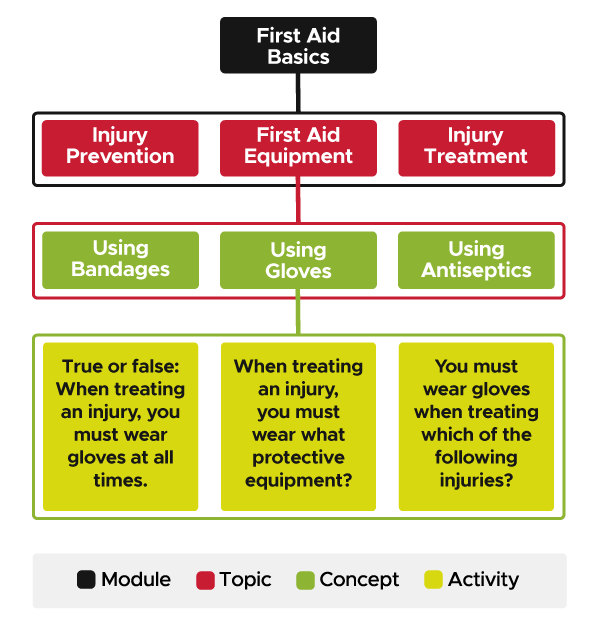 James needs to deliver some first aid training, so he creates a Module called First Aid Basics. Modules hold all of the training content on a particular subject. Modules are broken up into Topics. Topics are like chapters in a book; they are used to group together similar Concepts. James creates three Topics: First Aid Equipment, Injury Prevention, and Injury Treatment. Each Topic contains one or more Concepts. Concepts are like pages in a book; they are the individual building blocks of knowledge. Each Concept should focus on a particular piece of knowledge. In the First Aid Equipment Topic, James will create Concepts for using each item in the First Aid Kit. Within each Concept, James will create 3-6 Activities, designed to exercise the knowledge within the Concept from several points of view.